Tissue Procurement: Human ACL and PCL tissue is collected from cadaveric donors within 48 hours of death or as surgical specimens from a relevant procedure. The tissue is harvested from the knee joint from both clinically “healthy, normal” donors and from those diagnosed with rheumatoid and osteoarthritis. Proper consent and serological information is obtained on all specimens. 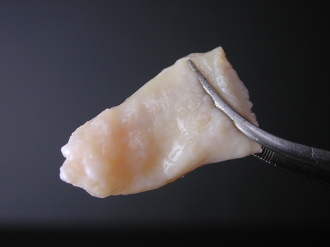 Tissue Processing: The ACL and PCL are aseptically dissected from surrounding tissues in the knee joint. ACL and PCL tissue slices are either flash frozen in liquid nitrogen and stored at -80oC or preserved with RNALater solution to protect RNA/DNA and then stored at -80oC. Frozen samples are shipped overnight with dry ice. Each ACL and PCL sample is approximately 1g. *Optional: Contact us at articular.info@articular.com to request a list of currently available donors.